Massacre burned brightly for less than 18 months in the early 1980s. They established the blueprint for the avant prog power trio; bridged the gap between 70s European RIO and 80s downtown New York avant garde; threw rock, free jazz, punk, dub and funk into the blender and could make your toes tap and your ears bleed at the same time; released a classic album; gave performances that remain legendary in avant prog circles to this day; then they quit while they were ahead. In short, a tough act to follow. Reviving the band in the late 90s with Charles Hayward replacing Fred Maher as drummer was always going to be a risky proposition, and this album manages to both please and disappoint. The bad news is that the short, wildly inventive pieces on the debut album have largely been replaced with longer, less focussed tracks, not all of which come off. The good news is that Massacre have not mellowed with age and have moved with the times - this is still fret melting, paint blistering stuff, and the post punk mutant funk/dub rhythms of their first incarnation have been updated. This can be heard most spectacularly on the 11 and a half minute Ladder, where Laswell and Hayward lay down a RIO version of drum and bass over which Frith plays some extremely mean and dirty guitar, sounding like the out and out rocker he could have been in an alternate universe. Elsewhere the trio explore the dark, dubby atmospheres only hinted at in their early work, with Hayward's melodica giving the impression that Augustus Pablo is jamming with Material on South Orange Sunset. For the most part though, this is an album of free jazz workouts using the primary colours of rock music, and as is often the case with such music it is sometimes hard work but rewards careful listening. The whole thing was superbly produced by John Zorn, with particularly rich and deep bass and drum sounds. 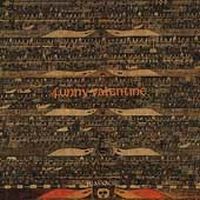 If it doesn't quite live up to expectations Funny Valentines is still a powerful slice of avant prog from three masters of the genre at the top of their game. Frith, Laswell and Hayward are incapable of being boring and at their best play with a white knuckle intensity that few of their peers can equal. This album is worth checking out, but definitely non essential.